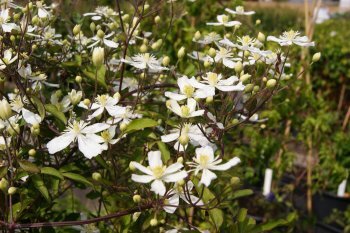 Today the first flowers of wild plants of Clematis viticella from Croatia. Thanks for sharing this with us, very interesting. When the plant is in full flower perhaps you can post a picture of the plant too? Strange things, by the way, viticella's. I had no opportunity to prune the viticella's in the collection after the Int Clem Soc left, so half June. Had I done so the new shoots would had new flowers buds by now. But non of the viticella's have flowers any more. Perhaps we should change the pruning and the flowering period on our labels? 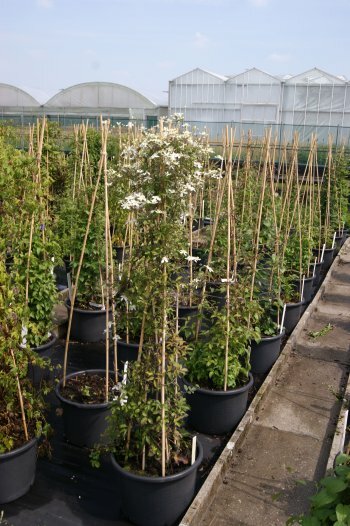 At the nursery the situation is of course very different; the explosion of flowers is about to start, I think another 3 weeks and colour-hell breaks loose. Should I ask you my favourite question or do you know what I mean? Of course I know what you want and you get a piece of a plant. I have pruned some viticellas 4 weeks ago and I have a lot of buds. You have told me that and good results. Thanks for the offer, Ton, a short piece of stem with a few flowers and "they" will be happy in the year 2587. I hope you have full origin information too which is very important. 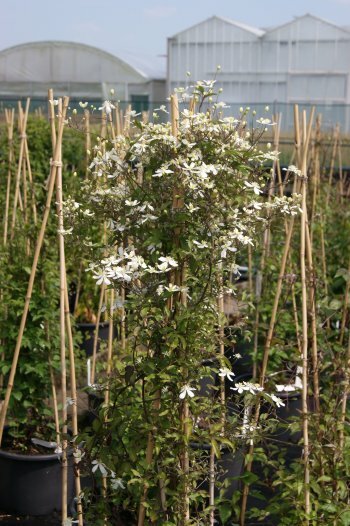 At the moment, before the "colour-hell" breaks loose at the nursery, nothing much is in flower other then Clematis kirilowii which I have in a 20 liter pot. The plant started to flower about 4 weeks ago and seems now at its peak. The flowers are nicely fragrant which I can detect several meters away. However I made a few herbarium specimens these are hardly interesting as I do not have any information about its origin. Normally, with this kind of plants, I throw them away when I have "finished" with the plant, which means; making a few pictures, a few herbarium specimens and when the plant is commercially not interesting for the nursery. But for this particular plant I cannot do that and that is why the plant is still with us for over 10 years now.